It’s such a universal truth that it has become a cliché: cold, winter temperatures make one yearn for comforting dishes. As much as I love delicate salads, they are definitely not what I need to fuel up on after shoveling show for over an hour. 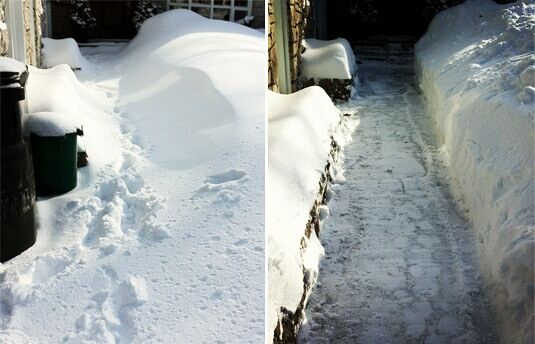 Last weekend, as I was getting my workout shoveling said snow, a family dish popped into my head: I wanted make a bouilli (“boiled”, literally), just like my mom used to make when I was a kid. 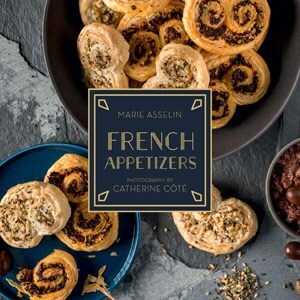 Bouilli is a classic Québécois dish which is a close cousin to the French pot-au-feu. It is usually made with low-cost cuts of beef and winter vegetables like potatoes, carrots, turnip and cabbage, all of which are slowly cooked in a broth flavored with herbs. My mom tells me that both of my grandmas used to make bouilli, and they usually made it in the early fall during the harvest season, as it was a great way to enjoy young, freshly picked vegetables. 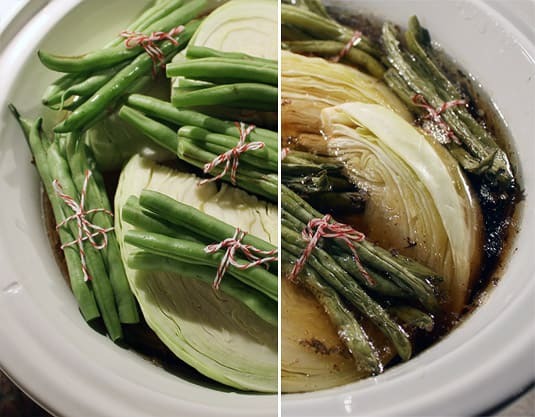 My mom’s mother added a piece of pork jowl to the pot to enrich the broth’s taste, and she also tied the green beans in small, individual bundles: two traditions my mom maintained and passed on to me. The dish was either served family-style, in a large plate placed in the center of the table, or in individual bowls where each person was served a piece of beef, a bit of shredded pork jowl, a slice of cabbage, a bundle of green beans and a portion of the other veggies. 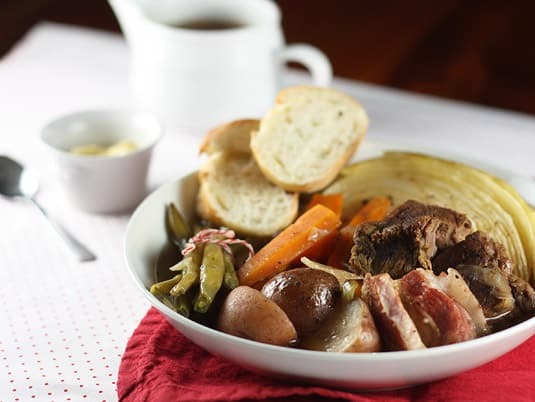 The French serve pickles with their pot-au-feu, but traditions differ on this side of the ocean. My granddad liked to pour a little bit of white distilled vinegar over his cooked cabbage (for a taste that reminds me of choucroûte), while a friend of the family introduced us to putting a slice of bread slathered with mustard at the bottom of each serving bowl. Pickles, vinegar or mustard, the goal is the same: adding a bright touch of acidity to an otherwise rich-tasting and mellow dish. Like pot-au-feu, there is no single recipe for bouilli – every family makes it differently. Some even make it with chicken or ham instead of beef. The following recipe is the way I grew up eating it. It’s a no-fuss, inexpensive but very satisfying dish that I think still deserves a spot in modern repertoires. 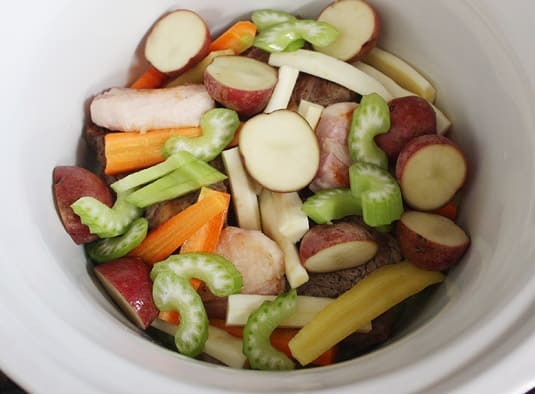 Although a slow cooker makes it even easier to prepare, it is still very simple to make it like my grandma used to, in a large pot simmering for a couple of hours, slowly filling the house with a rich aroma that’ll make any stomach growl – especially after coming in from the cold. I’m sure this dish has close cousins everywhere: Did you grow up enjoying such a comforting, slowly simmered dish as well? 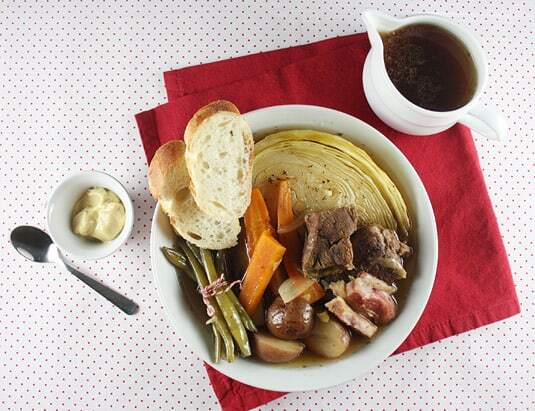 How does it differ from Quebec’s version of the pot-au-feu? Leave a comment to tell me about your family recipes! 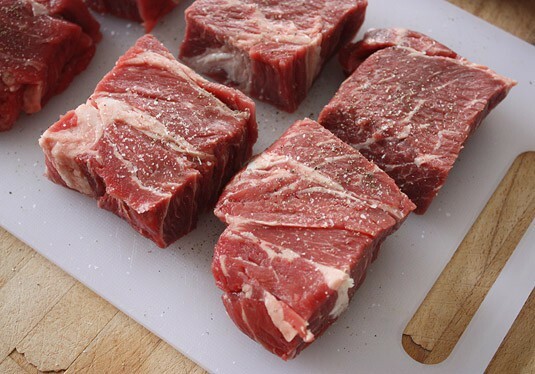 If you bought a whole piece beef chuck, cut it in 6 individual pieces. Sprinkle with sea salt and freshly ground black pepper. Heat a teaspoon of olive oil in a medium pan over medium-high heat. Sear the meat on all sides until golden brown, just a minute or two per side. Put the beef in a clean plate. 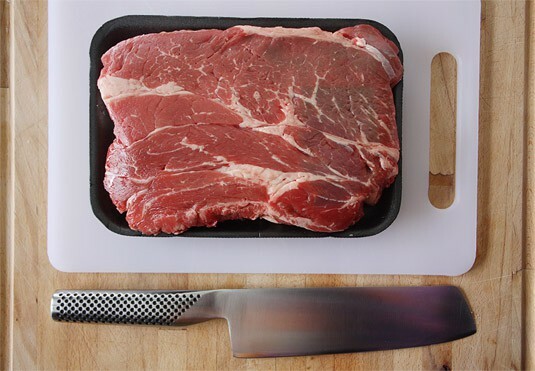 Sear the slices of pork jowl or belly quickly on both sides, then reserve with the beef. 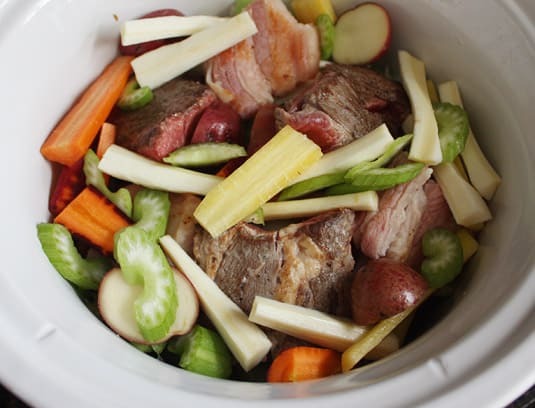 Put half the onion and celery in the bottom of the slow cooker’s pot and top with half the beef and pork. Add half the turnip, carrots and potatoes. Make another layer with the remaining onion, celery, beef, pork, turnip, carrots and potatoes. Add the bay leaf and dried thyme, sprinkle with freshly ground black pepper, a good pinch of sea salt, and add the beef broth. Cook on high for 1 hour, then on low for 4 hours. Add the cabbage slices and green bean bundles on top of the bouilli, pressing down gently. Using a spoon, baste the newly added vegetabled with the broth. Put the lid back on and keep on cooking on low for 1.5 hours. Cabbage and green beans, before and after cooking. Serve in a large dish family-style, or in individual bowls with bread, mustard and vinegar, if desired. Heat a teaspoon of olive oil in a large pot on medium-high heat. 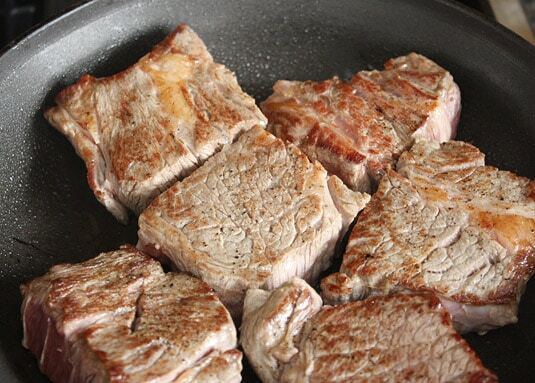 Sear the meat on all sides until golden brown, just a minute or two per side. Put the beef in a clean plate. 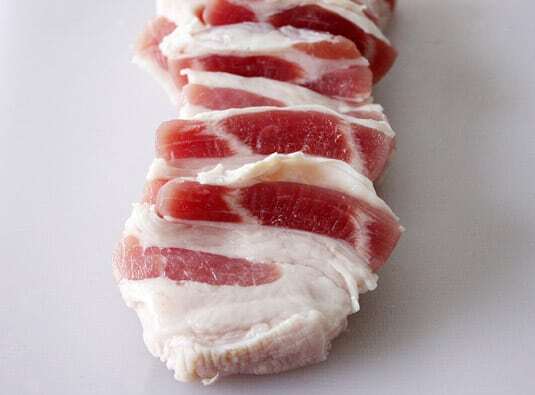 Sear the slices of pork jowl or belly quickly on both sides, then reserve with the beef. Lower the heat to the minimum and add the onion and celery to the pot. Stir around a bit to coat with the meat’s juices and fat. Put the beef and pork back into the pot. Top with the turnip, carrots and potatoes. Add the bay leaf and dried thyme, sprinkle with freshly ground black pepper, a good pinch of sea salt, then add the beef broth. Bring back to a boil, then cover and gently simmer for 2 hours. Add the cabbage slices and green bean bundles on top of the bouilli, pressing down gently. Using a spoon, baste the newly added vegetabled with the broth. Put the lid back on and continue simmering 30 minutes, or until the cabbage and beans are cooked and the beef can easily be flaked with a fork. 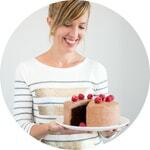 This post is my entry in Canadian Beef‘s contest that will send three lucky Canadian bloggers to food writing conference, Eat, Write, Retreat. 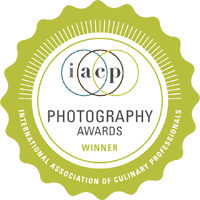 I’ve been longing to attend this conference since I’ve started blogging, so I really hope to get lucky this year! Cross your fingers for me please! 6 Responses to A Classic Québécois Dish: Beef and Winter Vegetables "Bouilli"
Mine is a bit different. I leave the me at in one piece, I use rutabaga instead of turnips, The cabbage is halved instead of sliced and I use salt pork instead of jowls or belly. I also use plain water and I add no spices as my grand-ma did not either. Finally I do not sear the meats. The meats get placed at the bottom and all vegetables on top. I do mot use green beans at all. The crock pot is set on high for an hour, then on low for 5-6 hours. The flavors are perfect without the spices and I believe that our ancestors did not have acces to them back then. It’s always a treat when the weather gets a little cooler here in Florida! 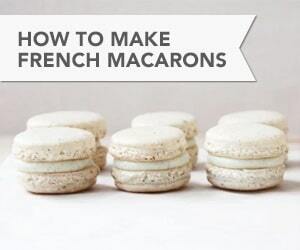 This is an amazing recipe. I am from Québec and my mother user to make this for me but never with this technique. I have bien snobing this meal for over 30 years but you have managed to rekindle the flame with this comfort food. Thanks for your kind comment Brigitte! 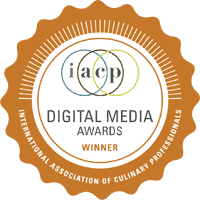 Nouvelle cuisine is great, but sometimes, old school dishes just hit the spot. I know I need my bouilli every year! 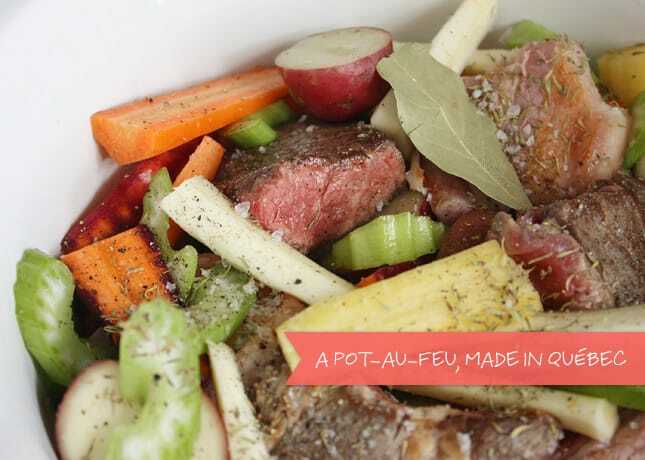 This is a beautiful post and I'm fascinated by the transition of pot au feu to boulli. 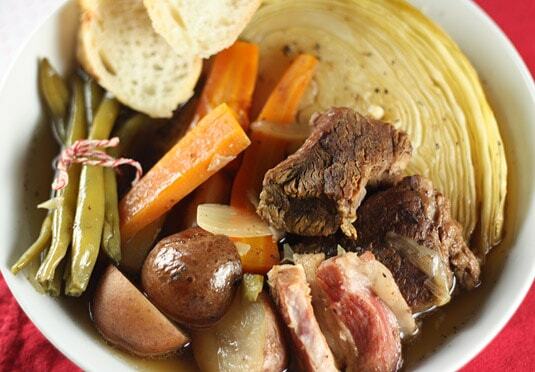 (Side note: I recently learned that Vietnamese "pho" is named after pot au feu — or so the story goes). 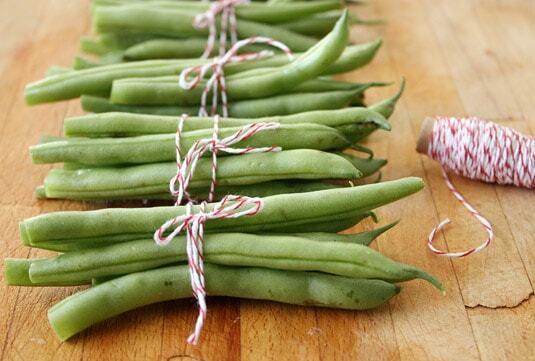 Thank you for sharing such a special family recipe, right down to the adorable green bean bundles! Oh my goodness. This looks amazing. 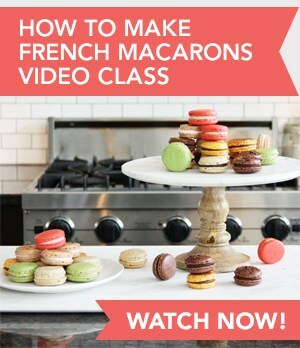 I'll be adding this to my list of recipes to make. I'm loving your blog. It was so great to meet you at Alt.